If you had ever stood in front of my cookbook shelf – actually shelves would be more appropriate, but using the singular form makes me feel a little less cookbook fanatic – you couldn’t have helped but notice a large section dedicated to Italian cuisine. Beyond argument, the Italian cuisine was omnipresent over the last years and not surprisingly among the most popular cookbook themes. Old classics and new bestsellers have occupied the bookstores’ windows, every celebrity chef chipped in and gave his or her view on Italian cuisine, more or less compelling. You’ll find a plethora of books dedicated to pizza and pasta, traditional family cuisine or even vegetarian food. The influx of titles raised my doubts about whether new publications could possibly generate more than a shrug of my shoulders. Don’t get me wrong, I adore Italian cuisine and I am almost positive that I could live on Vitello tonnato, Minestrone, Lasagne and Tiramisu only, probably for the rest of my life. But how many different interpretations of Italian food does a cookbook aficionado really need? So it may come as a bit of a surprise (certainly to me), that the last cookbook I feel in love with – yet again – covers Italian food: Beaneaters & bread soup by Lori De Mori and Jason Lowe. There couldn’t have been a better basis for this well written book, De Mori, a passionate food writer, who restored a 200 year-old farmhouse in Tuscany and Lowe, an award-winning food photographer – besides being her husband. Their love for Italy and its food shines through every line and photography. The rustic and unpretentious cover doesn’t give away, what beauty you’re about to discover. The choice of paper, the fonts, the overall style emphasizes the stories this talented couple shares with the reader: 25 gastronomic and food-related artisans are portrayed in an extraordinary intriguing manner, you can’t help but smile about carefully observed details. Prepare the vegetables: Cut the squash into small cubes (up to you, mine were a tad smaller than a cm / ~1/4 inch), discard seeds and skin. Slice the white parts of the leek in small julienne stripes (roughly 8 cm/3 inches long). 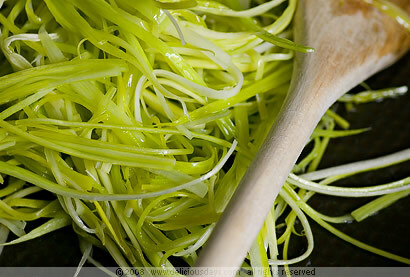 Heat the olive oil in a large pan and sauté the leek julienne over low to medium heat. The leeks are not supposed to brown, so you might add a little broth to prevent them from gaining color. When the leeks are soft (about 5 to 8 minutes), add the pumpkin cubes and cover with a lid. Make sure to stir frequently and add more broth if necessary. Stir in the chopped parsley as soon as the pumpkin has become soft (mine took less than 15 minutes) and remove from the heat until further use. Prepare the risotto: Add the shallots and half of the butter to a pot and sauté shortly until soft and translucent, but don’t brown them. 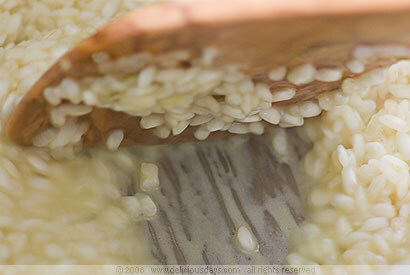 Add the rice and stir over medium heat to coat the grains with the butter, then add the white wine and stir as long as most of the liquid has evaporated. Now add a cup of the warm broth and stir gently until almost all of the broth is absorbed. Add a little broth at a time, continuously stirring and having an eye on the pot to not let the rice stick to the bottom. Do so for about 15-20 minutes, or until the rice is almost tender and done. Finally add the sautéed vegetables and cook for another minute or two. Fold in the grated Parmesan, the remaining butter and season with a pinch of nutmeg and freshly ground pepper to taste. Serve with additional grated Parmesan and chopped parsley. Prep time: ~10min., cooking: ~30min. I think traditional Italian food is a pretty small sphere of recipes and everything else is fusion or "new-age" Italian. Of course, that doesn't mean that it's not good!! I'd be curious to see what's different about this book. A very good korean friend of me hates nothing more than risotto. Compared to asian rice he always defines risotto as an ordinary stodge. One day though he asked me how to make a good risotto – in his rice cooker! Vielen Dank for the reminder! 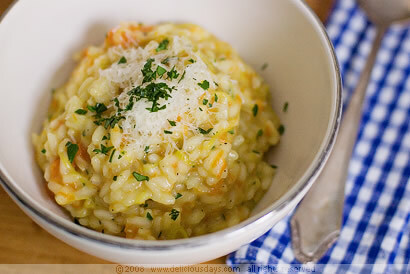 I love risotto, I love leeks, I love pumpkin, I know what I will have for dinner tonight! Thanks for being a constant inspiration! I feel I need a risotto right now and I need this book right now too!! I love the idea of adding the julienned leeks! Yum! Will have to give my current favorite (with spinach, garlic and parsnip) time to take a rest and try this one. I think the nutmeg must be fairly essential? I expect it really complements the earthy-sweet squash. I have quite strong views about risotto as I know others do too! Recently, I ate at London's Ooze risotto bar with a friend where she asked for her risotto to be made without butter or parmesan - to me this was unthinkable!! What is the taste difference between a pumpkin and winter squash? Thanks! Leek & squash - that looks like a fantastic combo! I cook risotto with squash and shrimps, but an all-veggie sounds great. I absolutely love Italian food, but I completely agree with you (where else can it go, without losing authenticity)...the Silver Spoon cookbook is great, which I'm sure you've heard of (and probably own) and I also like the chef Giada De Laurentiis, from the food network. She keeps italian food simple and accessible, without sacrificing flavor and authenticity. PS. Great post and I love this blog! ...and now I'll have to get this book! I will have to try this on Saturday. Leeks are a great alternative for aiming for a fall/winter theme but don't want mushrooms. Risotto in the winter time is almost the best thing I can imagine.... Yummy! Why is it every time I visit your blog I get hungry? Haven't had a good risotto for much too long. Perfect match with a wild duck breast. Why do so many people think that a good risotto isn't easy to do? If you can stir and follow some simple rules like using only the best ingredients, it's the easiest thing I can imagine. Squash risotto is one of my favorite things to make. Now I might have to add some leeks to mine! does anyone know how to make risotto without butter or cheese? I am gluten and dairy intolerant. Thank you! Oh ja, Brotsuppe, die hatte ich schon ewig nicht mehr und ich suchte gerade 1 Idee für den schönen Lauch in meinem Kühlschrank.. I have a ton of cookbooks, and very few of them are Italian...I think I will seek this one out! Funny! I'm Italian, born in the North, and living in Rome for almost 5 years. In Rome I've learned to cook and re-discover my family recipies and my culinary background. And I didn't own a cookbook on Italian cuisine. But often I search for inspiration in english, french and german blogs. And it's funny that many of the books on italian food are written by no-italian people. I'm in love with german cuisine: what wonderful cakes and soups I eaten in Oesterreich and German. Hi Rossella, You name it. I can't help but feel a little wary, if people write about a certain cuisine without having lived in the respective countries, at least for some time. If you love Austrian cuisine, maybe you want to check out my friend Johanna's blog, she's a native Austrian with fantastic cooking skills! And my friend Hande just recently moved from Germany to Rome, her blog is another great read! This is my kind of risotto! Just discovered your site, you should have a disclaimer "Do not visit when hungry!"